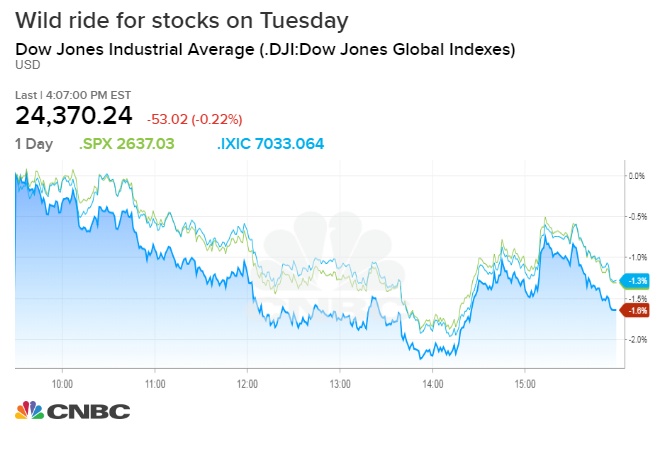 The Dow Jones Industrial Average closed lower on Tuesday after alternating between gains and losses throughout the session in the latest bout of market volatility. The 30-stock Dow fell 53.02 points to 24,370.24. At its high of the day, the Dow rose as much as 368 points. It also fell as much as 202 points. The S&P 500 also slipped to close at 2,636.78 while the Nasdaq Composite rose 0.16 percent to 7,031.83. Stocks initially rose more than 1 percent across the board amid signs that U.S.-China trade relations could be improving. Bloomberg News reported earlier on Tuesday that China is moving toward cutting tariffs on cars made in the U.S. to 15 percent from the current 40 percent. The proposal has been submitted to the Chinese Cabinet and will be reviewed in the coming days, the report said. A U.S. official later told Reuters that China indicated it will cut the tariffs, but the U.S. would wait on formal documentation and timing. Trump also tweeted the administration was having "very productive conversations going on with China," adding: "Watch for some important announcements." Shares of Ford Motor, General Motors and Fiat Chrysler all closed higher. "It is important for the market to get positive headlines at this time," said Quincy Krosby, chief market strategist at Prudential Financial. "The algorithms work instantaneously and if we get someone with an opposing view we could turn around." Some of the initial optimism was dampened after The Washington Post reported the U.S. will condemn China over hacking and economic espionage, potentially ratcheting up tension between the two countries once again. Equities fell to their lows of the day around noon after a contentious fight between President Donald Trump and Democratic leadership over border security. Trump threatened to shut down the government if more money was not allocated towards building a wall along the U.S.-Mexico border. "I have been around for not quite 80 years and I have never seen anything like this … and the stupidity to let it go on," said Art Cashin, director of floor operations UBS. He added that the televised exchange increases uncertainty around the projects will move forward in a divided government. "It doesn't look like they'll get very much done." Equities have been increasingly volatile of late. The Dow and S&P 500 are both down more than 1 percent for the year after hitting all-time highs. Last week, mixed messages surrounding a U.S.-China trade truce struck between Trump and Chinese President Xi Jinping led the major averages to their worst weekly performance since late March. The two indexes also fell sharply on Monday, along with the Nasdaq, before a sharp rebound led by tech stocks. But despite the heightened volatility, Peter Cardillo of Spartan Capital Securities thinks stocks can rally into year-end from here. "There are two major factors here: a new level of trade talks is under way, and the number of bearish market calls got significantly higher," said the firm's chief market economist. "That usually signals the end to an ongoing sell-off."